Holley’s NEW EFI Throttle Bodies are unquestionably the BIGGEST BORE – MOST FEATURE LOADED units available on the market today. 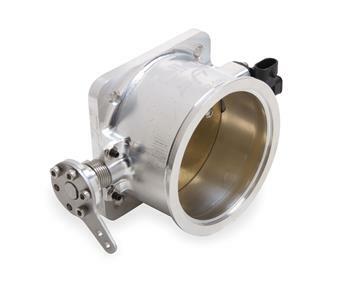 Holley went back to the drawing board and built the ultimate air valves for your hotrods power plant. The New 105mm Mono-Blade throttle body is designed with a 4” V-band flange, or Dual O-Ring, perfect for the most radical turbocharged combinations. These throttle bodies are feature packed, showcasing roller bearing throttle shafts, non-contact magnetic TPS sensors, and index-able throttle leavers. Making these the ultimate throttle bodies for ease of installation and tuning. Regardless of whether you have a turbo, supercharger, or a big cam engine pumping massive gulps of air, Holley’s throttle bodies are maximized for your application.